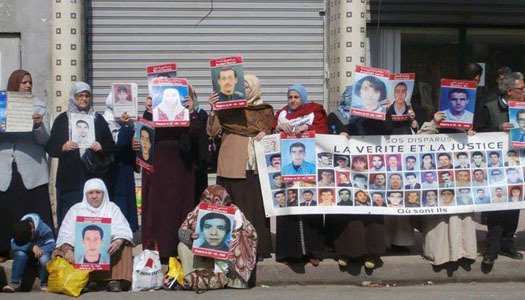 For more than two decades, some 40 women have been protesting every Wednesday against government inaction on the disappeared in front of Algeria’s official human rights commission. 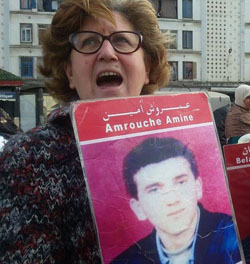 They stand on the sidewalk holding photos of their disappeared relatives — their children, fathers, and husbands — breaking the silence at a dangerous time in Algeria. The police try to disperse them, angry passersby accuse them of belonging to terrorist groups, some tell them to move on and forget it. But they come back every Wednesday, they don’t waver in their demand for the truth. In 1991, after the military annulled election results that would have brought the Islamist party to power, Algeria was plunged into a civil war, the “Dark Decade,” which lasted through the 1990s. At least 150,000 people were killed in the violence and 7,200 were disappeared. After the conflict, the government passed the Charter for Peace and National Reconciliation in 2005 to provide amnesties to state security forces for past violations and grant some compensation to the families of the disappeared. But the government refused to reveal the truth about what had happened to the missing. It required families to officially close the files on their loved ones in order to obtain compensation. Many families refused. So the women have continued their weekly protests, as other family members have joined them, including from the younger generation. Women have a particular history of resistance and struggle in Algeria. They played a key role in the country’s war of independence. Yet, after independence was won in 1962, they faded from the public space. By protesting enforced disappearance and demanding action, women have reclaimed a part of the public space. And many now share the experience of going outside their homes to confront state institutions. 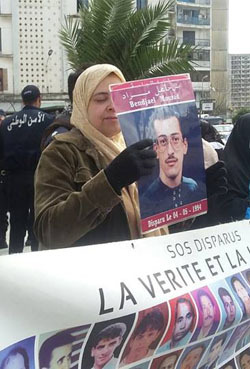 As a part of ICTJ’s series on transitional justice dynamics in the MENA region, this story of Algerian women who lost their relatives to enforced disappearance is another example of how victims’ families undertake arduous paths to justice against the odds. In Arabic interspersed with French, the women told me the stories of the family members whose enforced disappearance marked a new chapter in their lives. They have clung to the flimsy hope that after all these years their loved ones could still be alive. They introduced themselves to me as the mother of Hakim, the wife of Aissa, the sister of Murad. Their sense of identity remains caught up in the disappearance of their loved men. But this story is about the women as much as their lost loved ones. It includes their pain, persistence, disrupted lives, and unfinished sentences. Their testimonies remind us that these violations do not heal with time, nor do they fall under a statute of limitation. 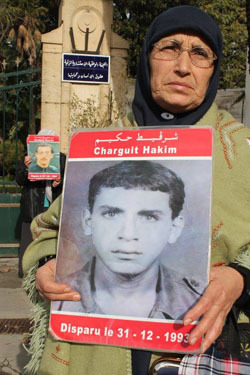 I’m the mother of Hakim Cherguit. They came to the house at 1 am. They were police officers accompanied by military men. It was 1993, and he was only 27 years old. He was engaged, and I was planning his wedding, but then he vanished. He was never politically active. I went looking for him. His father didn’t. I had to go out and search for him. I had to take responsibility. I was 54 years old, and I had five other children. I forbid them from getting involved because I was scared they’d get hurt. I want my son back. They didn’t give him justice; there was no trial. When they came to the house, they said they wanted to question him and release him. I waited and waited . . . and then went outside to police stations looking for him. In 1998, I joined the organization [SOS] so I wouldn’t feel lonely. I’ve protested every Wednesday with them since then. It’s my right to know what they did to my son. I didn’t accept compensation from the government. I can’t replace my son with money. They called me to try to convince me to take the money, but I told them what I needed was the truth about my son: if he is alive release him and if he is dead give me his bones. I’ve buried two other children: one was five years old, the other was two. I know where their bones are. I’m at peace with this because I know where their graves are. Until now [the state] refuses to give me any certificate he is a disappeared person. I believe he’s still alive. Sometimes I search for his face in the crowds. I’m waiting, but I’m not young. I’ve grown old waiting. The terrorist groups didn’t kidnap my son. It was the government; I saw them, they were at my house. Until I die, I won’t allow such a story. The government must tell me the truth. I became sick, but I can’t stop looking. Every morning I tell myself I need to go out and search. Now 23 years have gone by. It’s a long, sad story. My oldest son is 60 years old. I got married when I was 16. I gave my youth to this country. I fought for its liberation and risked my life, and this country took my son away. It’s a blow that’s broken my back. I regret ever fighting for it. What did I get from Algeria? It kidnapped my child. I’m the wife of Aissa Lakhel. They kidnapped him in 1996. He left in the morning and never came back. The neighbors told me the police had taken him, that there was a police raid in the neighborhood. I waited two days and then went to the police station looking for him. I left my girls with my mother. I have three daughters. The oldest was six years old, the youngest was one. They’re still waiting for him. They don’t go to the Wednesday demonstrations because they have unpleasant memories. When they were young, I used to take them with me to the meetings. It was hard for them to hear about their father and then go home without him. One of them is married now, and her husband asks me every Wednesday about the developments. My husband was 44 years old, and I was 39. Before the incident, I was a housewife working from home as a seamstress. When they took him, I became sick and couldn’t work anymore. My father and oldest brothers have carried the financial burden. It was hard to ask them for help and tell them what I needed for the house or for the girls. It caused me a lot of pain. It was easy when the girls were young; when they got older things got complicated. Words couldn’t express my suffering. I only had my tears. He [Aissa] was the head of our household, carrying all the responsibilities. And then he suddenly disappeared, and I was left with three little girls without a home. What could I do? Where could I go? My husband’s family calls me from time to time to see if there’s any news, but they don’t help me look for him. I need to know where the police took him. In every conversation with the government I only ask for the truth. We need to know what happened to the missing because they’re human. But I only get the same answers; my questions are ignored. A year and a half ago I started sending letters to government officials, but I haven’t heard back from any of them. The reconciliation law was not for us, but for [the state’s] own benefit. There can be no reconciliation without the truth. There is no justice in Algeria. 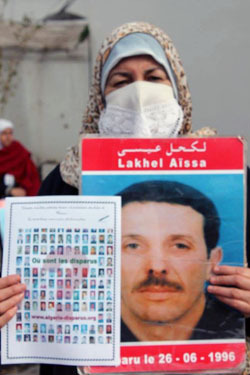 In other Arabic countries some of the disappeared were released but not in Algeria. No one was released. I try not to talk about my memories of him. I’m worn out from crying. I believe he’ll return at any moment. Only God knows, but this my feeling. I’m a patient person, but the past is very painful. I have my father and brothers; some wives have nobody. My daughters grew up alone; his story isn’t part of their lives as it’s part of mine. Only the real truth could heal this pain, not a partial one. He was my husband. I have a photo of him hanging in the house. I see it day and night. It’s in my room. Sometimes, I imagine talking to him. I’m the sister of Murad Bendjael. My brother Murad was arrested twice, once in 1992 and once in 1993, on charges of gathering in public and disturbing the peace. He was acquitted in both cases. On May 4, 1994, he left the house at around 6 pm. It was a Wednesday. He never came back. On Saturday, the police came to search our house and took my other two brothers. One spent 45 days in jail, the other five years. My mother went looking for Murad. The police told her he had been killed in a raid on his friend’s house when they tried to escape. When my mother told my youngest brother, who was in jail serving five years, he said, “No, mother. I saw Murad alive, here in prison. It was June 12.” My mother went back to the police station. They told her she had to believe either them or her jailed son. My mother said, “I believe my son. If he saw him, then Murad was alive that day.” Later, one of Murad’s friends told us he had also seen him in June. But he’s dead now, so we can’t use his testimony. My mother went looking for him but didn’t let us get involved because she was worried about us. She used to say, “When I’m too old to go out, you can take over.” That’s what happed in 2009. I’m here now. I’ve been going to every Wednesday demonstration since then. I didn’t get married. I’m the oldest daughter. In 2013, I went with the other families to the El Alia Cemetery. I didn’t tell the cemetery staff person, a woman, that my brother had been disappeared. I told her that I had a brother who died in 1994, but I didn’t know where he was buried. She looked up his name and saw his death registered on August 12, 1994. His grave had no name on it. I saw the name of a hospital in his file. I went there but couldn’t find any records on him. I found his death certificate at city hall. Murad’s information was accurate, but the person who signed it wasn’t a family member. I had never heard of him. In Algeria if someone dies of natural causes a family member signs the death certificate. The person’s address was on the document so I went to see him. The man used to work in the hospital. He said he was told to sign death certificates whenever a body was brought in that had been shot by the police. With the help of the organization [SOS], I asked for the body in the grave to be exhumed. I wanted to know for sure if it was Murad. The police refused my requests. Last year, we got a call from the police to come to the office. I was afraid my mother would hear the news about Murad from someone else so I told her about the grave at the El Alia cemetery. I said, “Please forgive me, I didn’t want to tell you until I was sure.” I kept the secret for two years. It tortured me. I hid it and cried. How do you to tell a mother her son is dead? The officers at the police station told us my brother had been killed by a terrorist group in 2006. How many times did my brother die? I remember when he and I fought he used to make it up to me with a little gift. How can I forget a brother like that? He was 26 years when they took him. I was 30. My son Amine disappeared in 1997, and I’ve been working on this issue of the disappeared ever since. I founded SOS in France in 1998 and then in Algeria in 1999. I wanted the French office to work on cases using international law and the Algerian office to work on organizing families, collecting files, and submitting complaints to the Ministry of Justice. When Amine disappeared I was in France and he was living with my mother. I moved to France after I got divorced, but the law wouldn’t let me take my children with me. They stayed with my mother. They called me and told me my son Amin hadn’t come home for two days. I booked a flight to Algeria. I thought the police had arrested him, but I didn’t think he’d been disappeared. I thought, when I get to Algeria they’ll release him because he wasn’t interested in politics or Islamist groups. I believed they’d arrested him by mistake and that they’d let him go after asking him a few questions. I was wrong. My mother and brother notified the police that he’d gone missing. When I got to Algeria, I went to the police station. They told me they had nothing to do with his case. I couldn’t convince myself to believe them. My brothers had some connections with military people. I was told that Amine would come back after Eid al-Adha. I waited but he never showed up. We knew that Amine was in prison for two months, and I lost track of him after that. I spent six months searching for him every day. I became sick. I couldn’t bear it anymore and left Algeria. When I went back to France I had a nervous breakdown and doctors gave me medicine. Days went by. One day I dreamed he was calling me, “Mother! Mother!” I woke up shivering. I threw away the medicine and went out looking for him again. I went to the UN. I had no experience with international law. I just knew about the UN. I sent them a letter and two months later I received a reply that my letter had been referred to the Working Group on Enforced or Involuntary Disappearances. I called them and we had a meeting. I talked to Amnesty International in Paris and London, and from them I learned there were many other cases like mine in Algeria. I was aware of enforced disappearances, but I didn’t know the scale of it. I took the addresses of Algerian relatives of the disappeared living in Paris and brought them together in November 1997. We were 10 or 11 people. I told them to fill out the application and send it to the UN Working Group. I tried international law because I was looking for some truth. We now have around 3,000 files registered with them. He gives me strength. He supports me. I remember my last phone call with him. It was after his visa to France was denied for the third time. He told me not to be sad, he would get a license to be a taxi driver. It was January. It was the last time I heard his voice. If he died I want to know how and why, and what his crime was. I was 23 when I got divorced. I didn’t ask for help from anyone. I worked hard for my children, to support them. And then 20 years later they came and took him like this? Read more on the impact of enforced disappearance on women in our report "The Disappeared and Invisible: Revealing the Enduring Impact of Enforced Disappearance on Women". PHOTO: All images used in this feature belong to SOS Disparus.